http://we-print.ru/listogibka.html гибка листового металла цены. The model painted like its prototype 2M62U-0001 at 2013, when it works at Likhobory depot of Moscow railroad. ATTENTION! FOR CORRECT USING OF THIS LOCOMOTIVE YOU NEED TO DOWNLOAD CABVIEW #3 FOR 2M62U AND SOUNDS #2 FOR M62! The model painted like its prototype 2M62U-0083 at 2010, when it works at Likhobory depot of Moscow railroad. The model painted like its prototype 2M62U-0104 at November 2009, when it works at Likhobory depot of Moscow railroad. ATTENTION! FOR CORRECT USING OF THIS LOCOMOTIVE YOU NEED TO DOWNLOAD CABVIEW_3 FOR 2M62U AND SOUNDS_1 FOR 2M62U! ATTENTION! 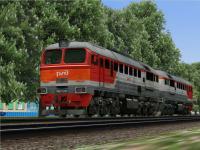 FOR CORRECT USING OF THIS LOCOMOTIVE YOU NEED TO DOWNLOAD CABVIEW_1 VER 2.1 OR NEWEST FOR 2M62U AND SOUNDS_1 FOR 2M62U! The model painted like its prototype 2M62U-0030 at May 2010, when it works at Likhobory depot of Moscow railroad. The model painted like its prototype 2M62U-0026 at June 2010, when it works at Likhobory depot of Moscow railroad. RZD (Russian Railways) passenger-and-freight diesel locomotive 2M62U-0127.